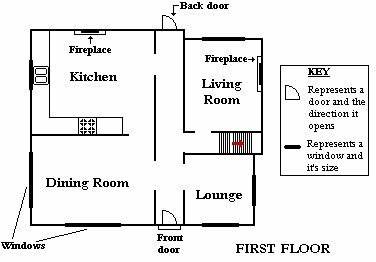 Here is a list of excerpts that I used to aid my drawing of the Dursley�s house. When reading these you may wonder how some of the excerpts are relevant but if read closely you will see that if they do not describe where something is in the house, then they describe something that is part of the house. I have bolded words for emphases. Page 19, When he went down the hall from his cupboard he arrived in the kitchen. 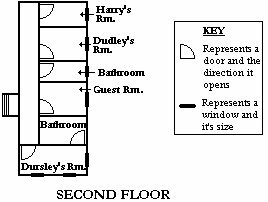 Page 37, The Dursley�s house had 4 bedrooms: one for Uncle Vernon and Aunt Petunia, one for visitors (usually Uncle Vernon�s sister, Marge), one where Dudley slept, and one where Dudley kept all the toys and things that wouldn�t fit in his first bedroom. Page 7, He gazes miserably into the hedge. Page 17, Aunt Petunia, who was bony and horse-faced, whipped around and peered intently our of the kitchen window. Nothing very helpful was found in either book 4 or 5.